On some Mondays, I question whether I have it together at all. A lot seems to not be yet “in synch” and the previous week feels very long ago. Monday often feels like a warm up, remind ourselves, get it together day. I don’t often say TGIF. But I often think TGMIO. TGMIO = Thank Goodness Monday is Over. Monday is the day when we don’t have the cushion of success immediately behind us. Anxiety is higher. Stamina is lower. Energy is inconsistent. When Monday is under our belt, it’s like the clouds part. The sun creeps in or sometimes it lights up the week bright and strong on Tuesday and holds fast. That was this week. Monday was a yikes kind of day. Tuesday started a torrent of amazing and I celebrate Tuesday, Wednesday, Thursday and Friday and all of their glory! 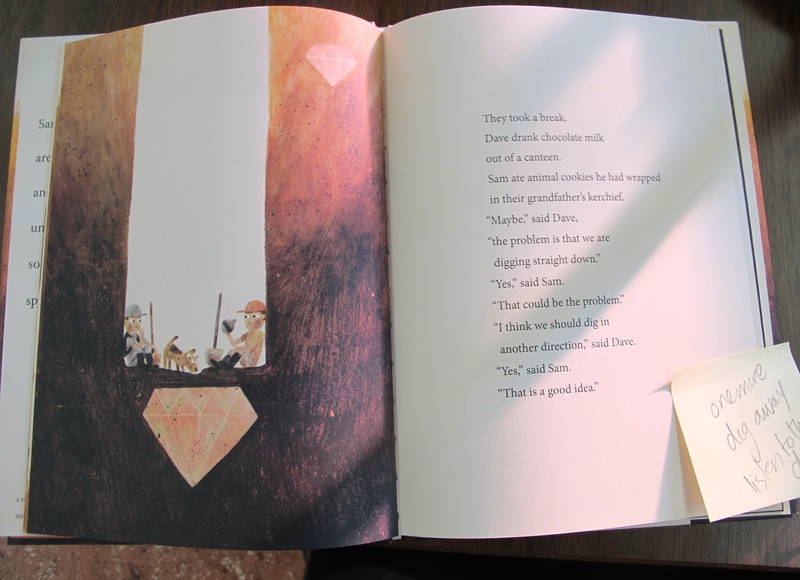 Reading Sam & Dave Dig a Hole by Mac Barnett and illustrated by Jon Klassen was a particularly special experience. We read it last thing Tuesday afternoon. I got to share it with a room of children and four adults (including my parents who volunteer on Tuesdays!) I loved listening to the children’s comments. Even more amusing might have been watching the other adults listen to these comments. I covered the pages in sticky notes – recording all of the utterances. I knew that reading this book aloud to this group of kids was going to be pretty fantastic. It totally surpassed my expectations. I celebrate math problem solving and the beautiful mess it creates! On Friday, we were all so lost in our work, we didn’t pay attention to the time. When it was time for library, I just had them all stand up, line up and go. We could clean up later. “Walk away from the math,” I had to prompt. They were so engaged! When the students left (it was my prep) I snapped a picture. 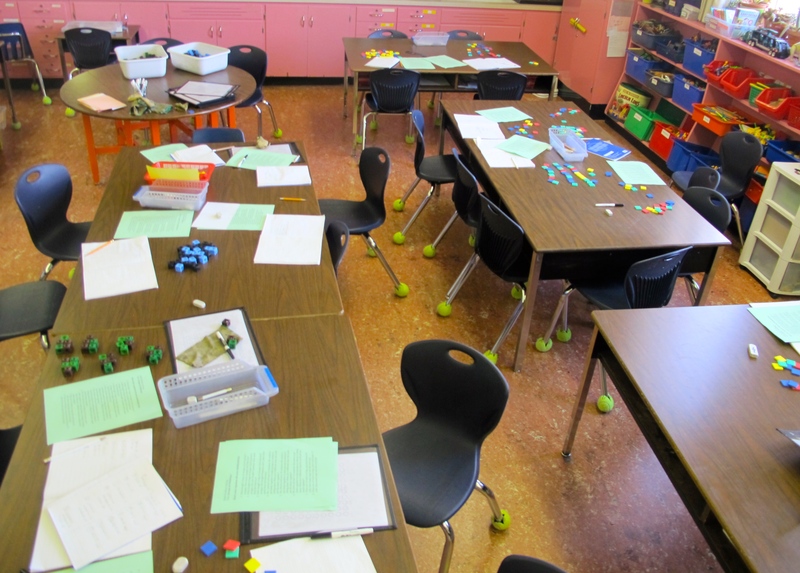 I loved the piles of manipulatives, the wipe off boards in use, the way notebooks were pushed together as little groups or pairs had formed to work together. We are mathematicians! We share ideas. We talk. We learn from each other. We take risks. This photo of the “post” math work period, reveals just that. It makes me smile. 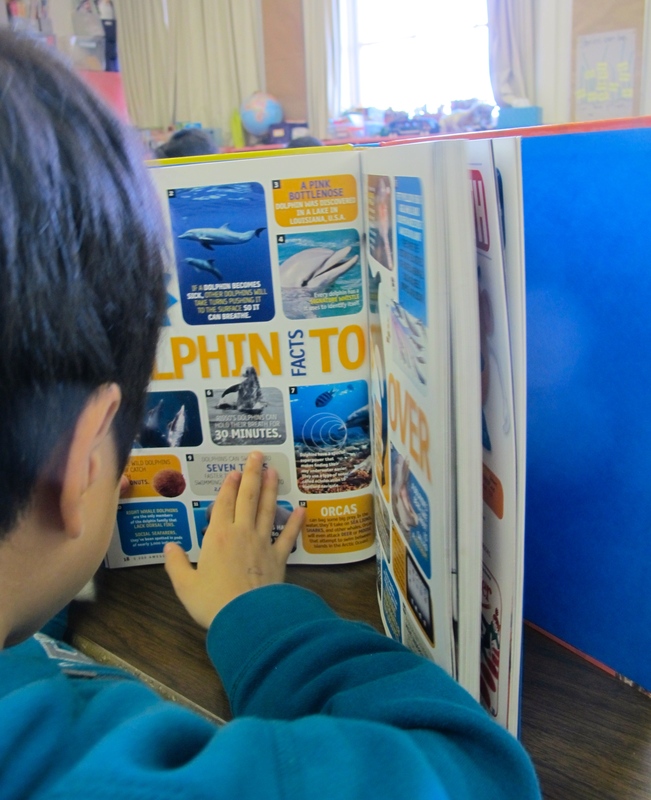 Even though my students are reading nonfiction titles right from September, I always do a big nonfiction launch in Reading Workshop starting in January. 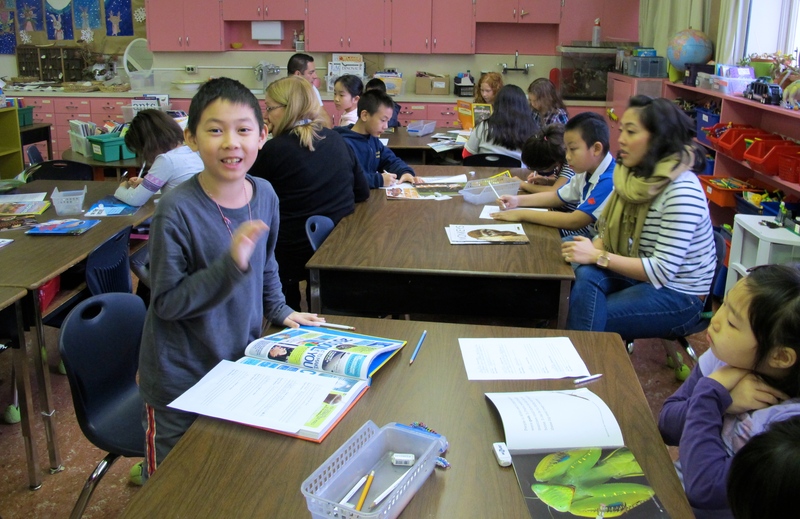 We have more guided instruction, more nonfiction book talks than usual, frequent mini-lessons, some nonfiction group activities, etc. Day one was so much fun. I simply put out the baskets everywhere around the room and give the children some recording sheets and send them off to be Fact Detectives. As they begin looking through books and recording, I am walking around noticing. What books do they gravitate to? Who remembers how to use the features to help them better navigate the texts? Do my new students feel comfortable locating and recording information? It’s noisy. It’s energized. It sets the tone for much more to come. As I walked around the room, children were sharing. Not just facts – but their thinking, reactions and questions. With me and with each other. And again I am celebrating the yoga in our room. It represents community. Focus. Space. Recharging. The children crave it. And thanks to the amazing Miriam who works with me, we are finding time throughout the week to practice. 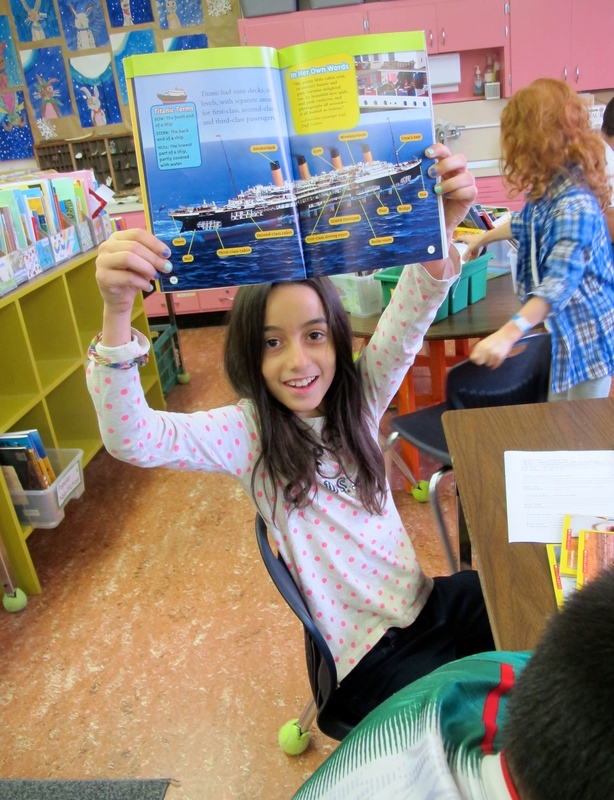 This entry was posted in Celebrate this Week and tagged Celebration, nonfiction, Reading Workshop, yoga by carriegelson. Bookmark the permalink. Oh, I know what you mean by the beautiful mess of a math lesson. I once met a teacher who said that he couldn’t let the kids use manipulatives because it distracted them from learning. I have had some parents thinking it is like kindergarten if third graders use blocks or pinboards. I guess they had never experienced and witnessed the rich discussions the hands-on lessons can encourage. The very name – manipulatives – I teach my students that it means that you can manipulate and change your thinking abound as you represent – love when children are unafraid to try problems a variety of ways. I love seeing kids get so involved with their reading. I really want to see more students use post-its to track their thinking. It’s something I will continue to work on with students. Thanks for posting the pics. It is always fun for me to share with photos – my camera is always with me. I always smile with joy reading your posts. Imagine how your kiddos feel! So many quotes in this I want to underline but this one impressed me. “Not just facts – but their thinking, reactions and questions. With me and with each other.” That is a biggie! Great week Carrie. Thanks for sharing! Thank you Julieanne! I hope all of my students feel that our classroom is a happy positive place. I am pretty sure that they do. What a great way to explain Mondays – “Monday is the day when we don’t have the cushion of success immediately behind us.” That’s very insightful. Thank you for sharing so many exciting moments from your classroom. Whenever I see your posts, I want to switch back to classroom teaching. So many wonderful things happening in your classroom, Carrie – learning joy, for sure. I can’t even tell you how much I love seeing those yoga pix. Why isn’t this happening in more classrooms? I wonder how school would feel for my older son if there were movement and mindfulness breaks in his day. Totally different, I’m thinking. I will be reading Sam & Dave in the next week or so in my Children’s Lit class and I cannot wait! We need to do regular activity and mindful breaks more than once a day. We do mindful breathing 3 x a day and try to do yoga 2-4 times a week. When the weather gets nicer, we do it outside. Carrie, I loved your title. It sounds like you had a great week and I love when the learning is messy. Even on a bad week, this title works Monday always leads to Friday. Thanks for sharing so many highlights each week. Do you have a yoga resource you use? It’s so alive in your classroom! Thanks Loralee! Never a dull moment! Our Librarian is so amazing, he has organized a Mock Caldecott for us. I get to start reading this week. I wanted to share that as I focus on writing more this year, your blog has inspired me to always make sure I’m sharing something about what we are reading in our classroom. I love practicing some yoga poses with my kids each day. We start each morning with practicing one pose. What age are you teaching again? This post describes beautifully what happens in a week! I look forward to hearing about the choices on your Caldecott! My children are LOVING it. We vote Tuesday. I have a Grade 3/4 this year. Many of these children were in my class last year when it was a 2/3/4 so we have a lovely community. 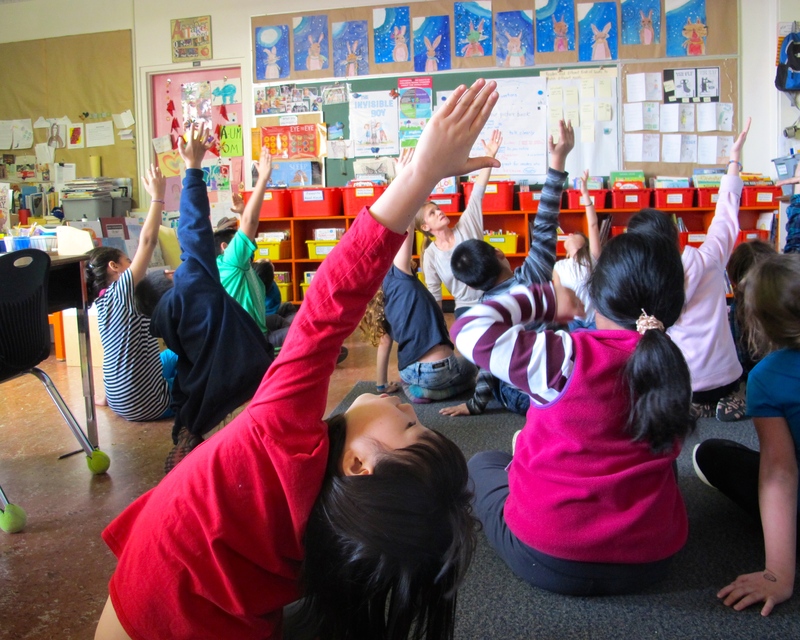 Yoga is really magic in a classroom. We start the week on Monday, get all the goals made, etc. It’s always a tough beginning & then students settle, the work begins, & I can say (to myself) ‘ah-h-h’. So much is going on & I love your ‘messy’ classroom. How awful for the lined-up desks & the students who have to just listen. Glad it was a good T, W, Th, Fr, Carrie. Thanks Linda and I get that “ah-h-h” 🙂 I know – I often think about desks in rows and what that would be like for kids today. I know it is the reality still for many. I only experienced that once in Elementary school when I was a child. It was so solitary. So foreign. Wonderful peek into your week! Love seeing the math learning and listening in on the conversations around nonfiction books. So fun to hear their enthusiasm for learning. I celebrate your words that Tuesday started a torrent of amazing. I like your acronym TGMIO – hope your Monday is a bit better this week! I hope so too! Last week was particularly blah as Miriam was away. When one of us isn’t there . . . But T- F made up for it! I love how one subject tends to blend into the rest. I want to be in your class! Thanks Earl! We do have a lot of fun.